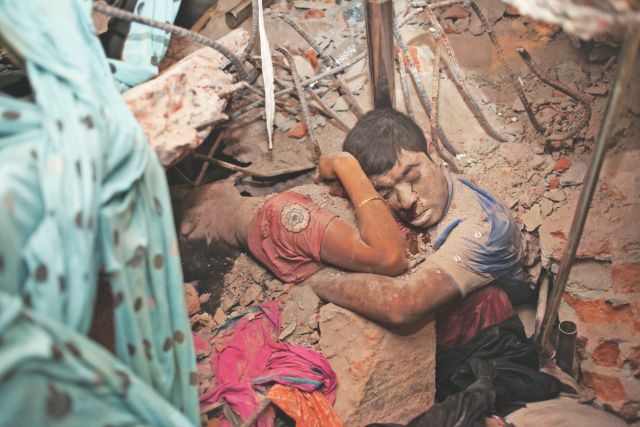 For me, nothing captures the human tragedy of the recent building collapse in Savar, Bangladesh more poignantly than the image of the man cradling a woman in his arms, her broken body balancing upon slabs of broken factory rubble. As their dead bodies lay in an embrace evocative of a Renaissance period sculpture, the one thing that is glaringly clear is the cost of cheap labor: real human lives. As a child in Dhaka in the 1980’s, I grew up during the beginning of the Ready Made Garment (RMG) era. As the sector quickly expanded and developed, it thrust thousands of young women into the workforce. 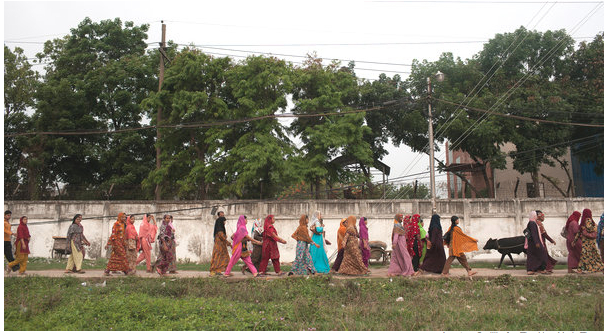 On our way to school every morning, we would always see throngs of young Bangladeshi women flood the roads in their neon colored traditional salwaar-kameezes, bright ribbon strings tied in their hair. They were all headed to work in the factories. I did not know it at the same time, but what was happening in Bangladesh was a social revolution, instantly empowering women by making them financially independent, many for the first time in their lives. Today, approximately 3 million women currently work in the sector, and while the extent to which they are exploited within the industry can be debated, few can argue that employment in a garment factory puts food in the mouth of workers, and their families. I feel so sad and angry that people who are generally not employers of large numbers of people, or involved in mass production, have been making such harmful, and often vicious comments about an industry which has built Bangladesh, and has given so much independence to our women. This sector has grown into a $20 billion industry in about three decades, with 90% of its workforce being women. This is something to be very proud of. The fact remains that though micro-finance is heralded as a triumph for helping Bangladesh alleviate poverty, factory work for young women across the country gives families the income, health, and independence that they need to get out of poverty. In my 17 years of experience working with Bangladeshi garments factories, I have seen the evolution of the industry, as the making of garments, the compliances, the working conditions have improved, and are still improving, and empowering a new generation of workers. In the last thirty years, Bangladesh’s garment industry created a new burgeoning middle class in a country with one of the world’s largest economic gaps. The wealth generated from textiles is the single greatest source of economic growth in Bangladesh. While initially tea and jute were the most profitable sectors, that all changed in the 1980s when the garment industry in Bangladesh became the main export sector, and a major source of foreign exchange. Over the years, the list of global retailers who manufactured their clothes with cheap labor in Bangladesh grew endless, from JC Penny to Mango to Zara to Walmart to H&M to Tommy Hilfiger to Bennetton. Whenever I went abroad as a Bangladeshi, roaming through large Western department stores, and I would come across clothing with the “Made in Bangladesh” label, I would feel my heart swell with pride. But for all these years, us Bangladeshis have kept a secret. We all have been compliant in covering up the dark underbelly of our country’s booming garment sector. 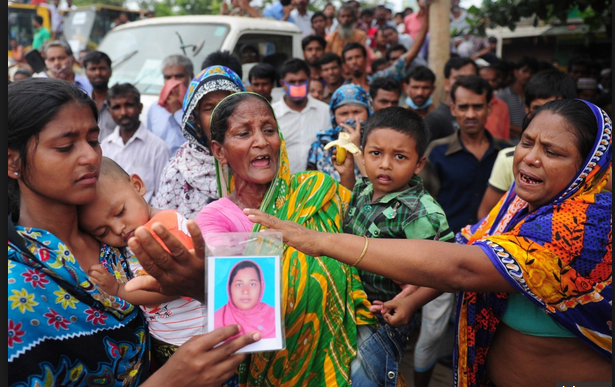 Even though the string of garment fires caused international outcry last year, Bangladeshis knew this was nothing new. Fires had been breaking out in overcrowded factories for decades, long before social media and the Internet let the world know about the deaths. Savar is different, not only because it is the worst industrial tragedy in Bangladesh’s history, but because it exposes how rampant and deep corruption run in a country where a bribe can buy you what you want, and laws are generally not implemented. 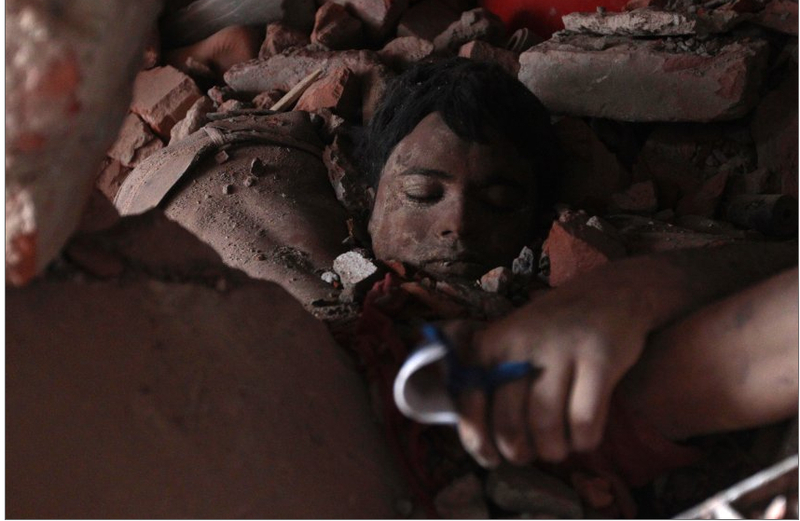 What does it say that today Bangladesh is at a point where we cannot even guarantee the workers, who are the backbone of our economy, that they won’t die at their job site from completely preventable causes? We can point fingers at Western buying companies as much as we want, and of course they have a huge responsibility in all of this. The greed exists on both ends. But the fact of the matter is the responsibility lies with us, with Bangladesh & with Bangladeshis. Garments is the bloodline of our country, and blaming the sector along with its Western buyers is economic suicide Bangladesh cannot afford. The truth is, we all have blood on our hands. From the Western brands to the Bangladeshi factory owners to the consumer hungry for cheap clothes, we are all guilty. But pointing the finger at the Western buyers is not the solution. If they cannot get their products made in Bangladesh, they will just go somewhere else, like the textile factories have done all through history. The solution has to come from us. The change has to come from Bangladeshis because the Savar tragedy can happen again, and not just in the garment sector. It can happen anywhere in Bangladesh. Experts estimate currently there are over 6,500 vulnerable buildings in the country, and warn that Dhaka can become unlivable. But the label on our clothing must also ensure that “Made in Bangladesh” is not made in Bangladeshi blood. No piece of clothing will ever be worth that. Just think about this, how many of these Sohel Rana’s are in Bangladesh fully supported by our Govt. for political reasons. This 8th grade graduate has so much political power that even police and RAB did not say one word to him. Savar is only a chip shot away from the capital and this guy can manage to do what ever his criminal mind wanted under the umbrella of our political party and with the blessings from our government. These need to end now. Where is the new generation at the Mukto Moncho. I do not hear any voice from them. Shame that all the leaders at Mukto Moncho sold them to the old way of doing things. These is a problem on the core in our heart. I feel so shame that I was born in the same country where person like Sohel Rana born and the others who supported him. Great post. I wish we should also see the collapse as an instance of structural failure and ask: how do we stop unsafe buildings? Its not like the building collapsed because there were RMG factories there. They could’ve been making cotton-candies! I can’t help feeling our hatred for naked capitalism has been channeled towards the garments sector as a whole. Safety and compliance at garment factories are really a long-term concern that needs evolution more than revolution. But it is not the only conversation that should be triggered by the Savar accident. We must question construction-safety and administrative oversight as well. I would really like to know that if the BGMEA feels that the reputation of the industry is tarnished by a case of “few bad apples” then why didn’t they take precautions to avoid such bad apples, especially since they have had the chance for the last 15 years? And even after the Tazreen incident? Also, the BGMEA has failed to compel their international contractors to sign up with BD govt’s 2012 MoU on fire safety at RMG factories – if they weren’t so submissive to the international buyers and actually stood their ground, their reputation would not have been at stake at this point. The other thing to consider is the role of media in the portrayal of the RMG sector. All we hear are the quarterly updates of how much money the industry has rolled in or when there is a disaster. or strikes. How come the media doesn’t talk about workers’ rights? Or even the fact that a Tazreen fire survivor, Sumi Abedin, and Kalpona Akter, a labor activist, have been touring the US to raise awareness about the working conditions of RMG factories? or their low wages and the human price of clothing? In the end, I agree with you that the change must come from us, rather than expecting the Western contractors to step up to this challenge. As we all know, an efficient capitalist machinery at work has little time to deal with such “human” nuances. Dear Anushays, Pls try to help Bangladesh if you like Bangladesh. Problems are everywhere in the world, not only in Bangladesh. In China there were more collapse than DAC. Pls try to protect Bangladesh if you love it. Pls dont try to promote yourself by focusing bad things of Bangladesh. We have many good things also that you never write. I have now read several of your articles about Bangladesh and, as a ‘bideshi’ living here and working with the poor, I can tell you your writings have gained you a new fan! As one writer to another, I admire your work and look forward to reading more. Thank you so much, Bideshi Ken 🙂 Thank you for reading my work, and I would love to read some of yours, too! I also have a novel about Bangladesh just accepted for publication so I’m looking forward to that being available soon. Thank you for your lovely reply.